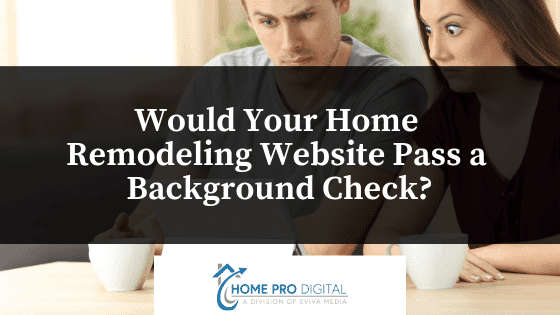 Would Your Home Remodeling Website Pass a Background Check? When a homeowner visits your website, what do they see? First impressions are crucial, and people tend to make snap judgments when it comes to choosing a contractor. Your website needs to look polished, but it also needs to include content which inspires trust and indicates a proven track record of satisfied customers. This is especially true for contractors because clients don’t often jump to hire someone for expensive home remodeling or building projects when their website looks less than professional. It’s not enough for your site just to look pretty, though. No one wants all style and no substance, so you want to be sure you’re offering potential customers a wealth of reasons why they should hire you. When your target audience reaches your site, it’s likely because they’re doing the hard work of diligently researching potential contractors to ensure they’re working with someone they can trust. When managed properly, your website can more than pass the mental background check customers want before they trust someone with one of their largest investments: their home. Bland or sparse content sends a weak message, indicating you’re either not invested in the quality of your website. Those are the last kinds of impressions you want to leave on potential clients, so it’s important to make sure you’re building your site around professional, polished content which casts your business in the most flattering possible light. No one wants to gamble on a contractor with a shaky or unproven history, so be sure your site includes plenty of space where your satisfied past clients can share their experiences with people considering your services. Collect testimonials from clients and display them proudly. Highlight notable reviews left on community sites like Yelp, Houzz, and Angie’s List. Written praise isn’t all you should be including, either. Your website is exactly where you should be bragging about yourself and the accomplishments of your business. For example, if you’re a NARI member or have a great rating by the BBB, make sure the association badges are clearly displayed. Include photos from finished jobs you’re especially proud to create a virtual portfolio for anyone visiting your website. It’s also wise to post these photos regularly to social media platforms like Instagram, Facebook, and Houzz. These accounts can be invaluable marketing tools, making them another crucial aspect of your online presence. A strong business website is important, but it’s not the only piece of the puzzle. Links to social media accounts should be easy to find, but it’s important to keep your social media regularly updated. When customers leave your excellent business website to look at your social networks, you don’t want them to find an empty Instagram account or a sparse, rarely-updated Facebook page. An active social media presence sends a message of dedication and approachability to potential customers and makes it easier for them to see public feedback from real customers. You also want to provide people with ample opportunity to reach out for an estimate or to establish a relationship easily. The more options prospective clients have for contacting you and the easier those options are to locate, the more likely they are to initiate the process. Once they’ve been impressed by your exceptional portfolio and glowing testimonials, your potential customers need to be able to reach you with ease. Whether you’re ready to start establishing your web presence or trying to take your existing presence to the next level, a great website and social media presence can make all the difference. We’re here to help you make the most of your virtual presence.